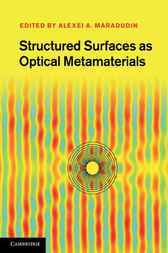 Optical metamaterials are an exciting new field in optical science. A rapidly developing class of these metamaterials are those that allow the manipulation of volume and surface electromagnetic waves in desirable ways by suitably structuring the surfaces they interact with. They have applications in a variety of fields, such as materials science, photovoltaic technology, imaging and lensing, beam shaping and lasing. Describing techniques and applications, this book is ideal for researchers and professionals working in metamaterials and plasmonics, as well as those just entering this exciting new field. It surveys different types of structured surfaces, their design and fabrication, their unusual optical properties, recent experimental observations and their applications. Each chapter is written by an expert in that area, giving the reader an up-to-date overview of the subject. Both the experimental and theoretical aspects of each topic are presented. "This book brings together a number of experts from the United States and Europe who have contributed to both theoretical and experimental studies of a range of interesting phenomena including extraordinary transmission through subwavelength apertures and negative refraction in both periodically corrugated surfaces and plasmonic structures. The book is very well produced and includes several striking color illustrations."